The Astro Pneumatic 3088 Digital Pocket Tire Pressure Gauge and Auto Emergency Tool is designed to measure tire pressure and read PSI, BAR, and KPA through a durable metal nozzle. The pressure is displayed on a bright backlit LCD screen. This tool is also constructed with a steel window escape hammer, which quickly deploys at the flip of a switch, and a recessed blade to cut through seatbelts in case of an emergency. It is also constructed with a bright LED flashlight for nighttime emergencies, and a red LED light to reveal the valve stem when measuring tire pressure in the dark. It is powered by two AAA batteries (not included). 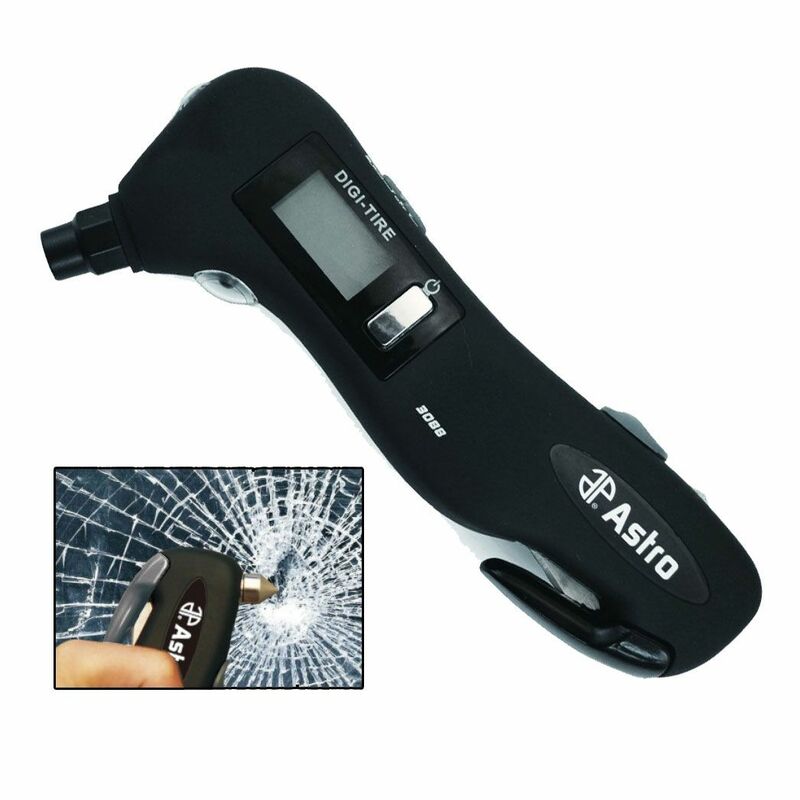 Astro Pneumatic Tool Co. warrants these products to the original user against defective material or workmanship for a period of 1 year from the date of 1st use. Astro reserves the right to determine whether the product failed because of defective material, workmanship or other causes and to charge back for missing parts. Astro Pneumatic Tool Co., at its discretion, will repair products covered under this warranty free of charge. The distributor should direct the original user to return the product with the distributor's name, address, adequate proof of date of purchase or a copy of warranty card, and a short note explaining the problem. Failures caused by accident, alteration, or misuse are not covered by this warranty. Astro will replace free of charge any part of a component product that fails within 1 year of first use by the original user. See New Defective statement for how to obtain the replacement. Items included in this category include kits, hand tool kits and any other product where there are multiple items or components that make up the unit. Please call 800-221-9705 to obtain product components covered under warranty. Astro will replace free of charge the power unit on select hydraulic equipment. Please call 800-221-9705 to arrange for replacement. Astro Pneumatic Tool Co. or its authorized service representatives must perform all warranty repairs. Any repair to the product by unauthorized service representatives voids this warranty. The rights under this warranty are limited to the original user and may not be transferred to subsequent owners. New defective product is product that does not function properly the first time used. Astro will replace "free of charge" to the original user any product that is deemed to be "New Defective". Original user may email astrotools@astrotools.com, call: 800-221-9705 or fax: 877-318-2194 a request to Customer Service for replacement with 1) proof of purchase or copy of warranty card and 2) a statement explaining the problem. Astro reserves the right to request that the original user return the New Defective product, freight collect, for evaluation prior to providing a replacement. Astro will pre-pay the freight on the replacement unit.